Zanzibar is not known as the “Spice Islands” for nothing. The spice trade has played a significant part in Zanzibar’s economy with clove being its most famous historical export. 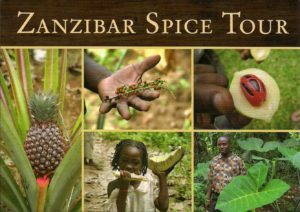 While you will see the spices packets everywhere, there is no alternative to taking one of Zanzibar’s top 5 tours through a local spice farm where, immersed in the fresh smells from turmeric to tamarind, the farmers will tell you all there is to know about Zanzibar spices, offering you tastings and even cooking lessons. Pongwe Beach Hotel can hook you up with a local and trusted spice tour guide who charge modestly. Before exploring Stone Town for yourself, take one of the top 5 tours in Zanzibar where your guide will give you a detailed history of the major landmarks from the House of Wonders to the Darajani market. This is a great way to get to know the streets and history of Stone Town before getting lost for yourself. Tour guides wait for business outside the House of Wonders, carrying badges, or you can contact Kawa Training Centre on [email protected] in advance who will hook you up with one of their trained graduates. From the beach at Livingstone’s in Stone Town you can take a local 20-30 minute boat trip for about $40 to visit Prison Island for a small entrance fee. While the Island tour offers you a uniquely interesting history of a building set up to hold rebellious slaves and then to quarantine traders for Yellow Fever, the real experience on Prison Island is the colony of Aldabra giant tortoises. The amazing creatures were a gift from the British governor in the Seychelles but are now a protected colony that welcomes you to pat their century old shells and feed them local leaves.